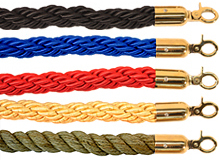 The VIP decorative posts and ropes product line-up features a solid variety of both classic and modern styling in post selections and the most popular of velour and braided rope choices available. Our VIP Crowd Control decorative posts, ropes, and stanchions product line-up features a wide variety of both classic and modern post designs, as well as the most popular and luxurious velour and braided ropes and stanchions available on the market. Our decorative options are some of our most popular, offering a unique aesthetic to formal events, businesses, openings, and public areas. We understand that “time is money.” With effective crowd control equipment solutions like rope stanchions, we can assure you that our stanchions and ropes will help you manage any number of customers and queues in any store, arena, party, or special event. Our stanchions and ropes can keep your customers moving, ensuring greater crowd control, more transactions, and higher overall customer satisfaction. If you’re in search of a stanchion rope that will hold up event after event, VIP Crowd Control’s decorative posts and ropes are the perfect solution. 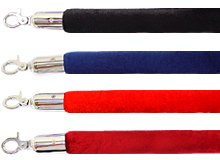 Gold or mirror polished stainless steel posts, luxurious velour or braided ropes, and matching colors can help your event appear more uniform with a touch of elegance! Our high-quality materials and solid construction ensure that you’ll be able to use our stanchion ropes at all of your events with no problems. You’ll get the same great crowd control, every time! Need to control your crowd for tonight’s event? With same-day shipping, we can help you get the perfect rope and stanchion for any party, event, or business within 24 hours! 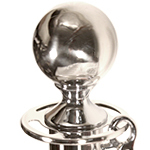 Contact our team today at 888-521-0328 and we’ll help you find quality stanchions to fit all of your needs. VIP Crowd Control is dedicated to customer satisfaction. We’ll do whatever it takes to ensure that our ropes and stanchions help you run smoothly while looking its best. 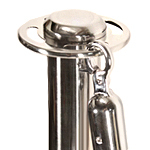 Contact us for the best stanchion ropes in the business. Easy assembly. Just mount the pre-assembled post to base, it's a snap! How many rope stanchions do I need for my setup? (Floor to top of post assembly) 35 3/4" 38 3/4" 40 1/2"
(Floor to top of post assembly) 36 1/2" 39" 40 1/2"
(Floor to top of post assembly) 38" 40 1/2" 42"
Post Diameter 2" 2" 2"
Rope Retainer Ring Diameter 4" 4" 4"
Flat Base Diameter & Height 12" - 1 3/4" 12" - 1 3/4" 12" - 1 3/4"
Royal Base Diameter & Height 12" - 3-1/2" 12" - 3-1/2" 12" - 3-1/2"
Flat Base Diameter & Height (Opt.) 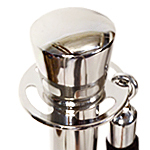 14" - 1-3/4" 14" - 1-3/4" 14" - 1-3/4"
Dome Base Diameter & Height (Opt.) 14" - 2" 14" - 2" 14" - 2"